MORE than $4 million in security upgrades to Jewish preschools across Australia was announced by the government this week. MOVED by the poverty and injustice he witnessed on a business trip to India last year, Melbourne-born Jacob Sztokman has set up a world-first volunteering program for young Jewish adults. Having launched this year, Gabriel Project Mumbai partners poverty relief with active partnership in the Indian Jewish community, offering 20 to 28-year-olds the chance to volunteer in Mumbai’s slums for three to four months, preparing food for children and teaching them English. FOSTERING vibrant relationships between the Jewish community and members of the Victorian Parliament is of prime concern to David Southwick, the member for Caulfield who recently led a delegation of Liberal MPs on an Israel study tour. 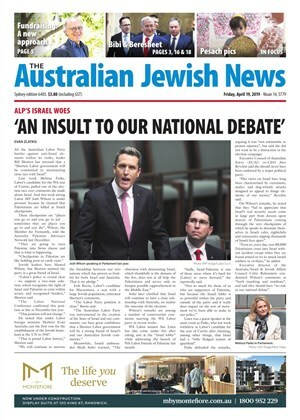 Co-ordinated by the Australia/Israel & Jewish Affairs Council (AIJAC) during July, the tour involved meetings with Israeli media, a visit to the Knesset, Temple Mount, the Western Wall and briefings on the history of Israel and its current work in the areas of innovation and research. TWO-anti Israel activists have been found guilty of assaulting police outside chocolate retailer Max Brenner last year. Sergio Tobon and Stephen Evans were convicted and fined $500 each last week by the Melbourne Magistrates Court for assaulting police during a violent scuffle in July last year. The incident occurred outside the store in Melbourne’s QV Square, at which 19 Boycott, Divestment and Sanctions (BDS) protestors were arrested. While five protestors remain charged with resisting arrest and assault, all charges of besetting and trespass have been dropped – a move defence lawyer Robert Stary hailed as “a landmark case in the annals of the criminal justice system because what it represents is people have a right to express themselves politically”. THE 21st century has seen sweeping change, global crises and vast leaps in technology and access to information. How the Jewish people cope with these challenges will be tackled at the Anti-Defamation Commission’s (ADC) 2012 Gandel Oration, where keynote speaker Brigadier General Gal Hirsch (pictured) will consider what lies ahead for the Jews. 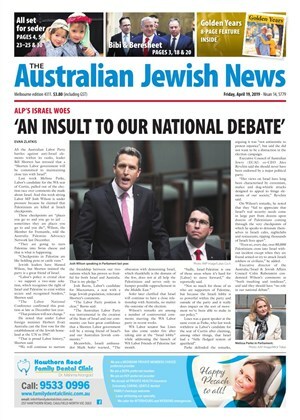 AFTER disparaging Greens policies in recent weeks, federal MP Michael Danby has said the party’s potential success in the upcoming Melbourne by-election would be problematic for the Jewish community. EARLIER this month, 25-year-old Josh Ferenbach from Access Inc, which caters to Jewish people with disabilities, took it upon himself to arrange a football training day with AJAX Football Club under Access’s leadership program. THIRTEEN Jewish schools have received a $4.7 million security boost in the third round of funding for the federal government’s Secure Schools Program. NINE months after the synagogue at Masada College in St Ives was destroyed by fire, the school has received a grant for a security and fire detection system upgrade.